Put chicken pieces in a non-reactive bowl. Add yogurt, garlic and curry powder. Stir gently to combine, cover, and marinate in the refrigerator for at least 1 and up to 4 hours. Once chicken is ready to grill, preheat a gas or charcoal grill to medium-high. Remove chicken from marinade and shake off excess yogurt mixture. Skewer chicken, peppers, onions and tomatoes on metal or wood skewers (see note below). Drizzle honey over skewers and grill until chicken is cooked through, about 15 minutes. Serve immediately. Note: if you opt to use wood skewers, make sure to soak in water for 20 minutes so they don't burn on the grill. 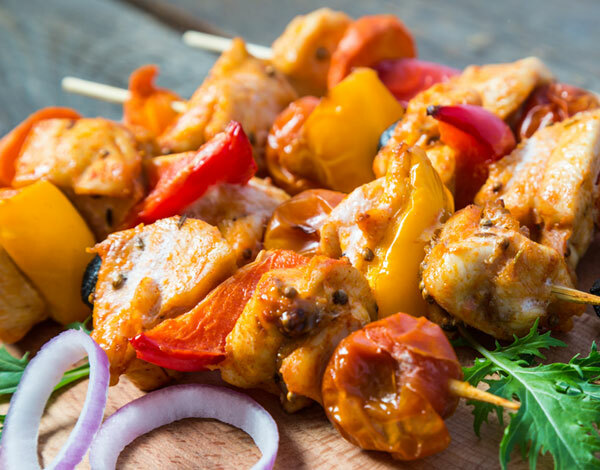 This is one of our favorite Summer grilling recipes -- an aromatic curry marinade is slightly sweetened with a touch of honey, and marinating the chicken in yogurt tenderizes it. Serve this with white rice, some naan, and a chutney of your choice.